The rift between the Gulf countries and Qatar has created a space for Asian countries to step in to engage with the small peninsular state. There’s a silver lining for Asian countries in the six-month old crisis in the Gulf that pits a UAE-Saudi-led alliance against Qatar. That is as long as Saudi Arabia and the United Arab Emirates shy away from attempting to harness their financial muscle to shore up lagging international support for their diplomatic and economic boycott of the idiosyncratic Gulf state. Asian nations, including India, Pakistan, Sri Lanka, Bangladesh, Indonesia and the Philippines, whose nationals populate the Gulf’s labour force, have already reaped initial benefits with Qatar, eager to put its best foot forward, significantly reforming its controversial kafala or labour sponsorship regime. Qatar recently became the first Gulf state to introduce a minimum wage, albeit criticized by human rights groups for being at $200 below earning levels in many of the labour-supplying states. It has also sought to improve workers’ rights and committed to improving their living conditions. Qatar was under pressure to reform the kafala system long before the Gulf crisis erupted, but the dispute with its Gulf neighbours strengthened its interest in being seen to be doing the right thing. Its moves are over time likely to persuade other Gulf states to follow suit. The boycott as a result of its refusal to accept UAE-Saudi demandsthat would curtail its independence has forced Qatar to restructure trade relationships, diversify sources for goods and services, creative alternative port alliances, and recalibrate the strategy of its national carrier, Qatar Airways. The UAE, Saudi Arabia, and their allies insist that Qatar unconditionally break its ties to various political groups, including the Muslim Brotherhood, adhere to Saudi and UAE foreign policy, reduce relations with Iran, shutter the Al Jazeera television network, and accept monitoring of its compliance. Qatar has rejected any infringement of its sovereignty and called for a negotiated solution. The two countries have so far shown no willingness to compromise on their insistence on unconditional Qatari acceptance, but have also shied away from escalating the dispute, by among others pressuring third parties to choose sides. The dispute has further divided the Arab world with some countries like Egypt and Bahrain siding with the UAE and Saudi Arabia, others like Jordan, Lebanon, Tunisia,and Algeria sitting on the side lines and calling for a negotiated solutions, and finally nations like Oman and Algeria who have stepped in to help Qatar offset the impact of the boycott. The fracturing of the Arab world was on display at a meeting in Cairo in mid-November of Arab foreign ministers. Saudi Arabia was able to wrest a statement condemning Iran and its Lebanese ally, Hezbollah, but failed to achieve a consensus as Lebanon teetered on the balance because of Saudi pressure. Without breaking the stalemate and the initiation of negotiations that at best would achieve a face saving formula that falls short of a fundamental resolution, the dispute is likely to settle in as a fact of life and further undermine the Gulf Cooperation Council (GCC) that groups the six Gulf states. Saudi Arabia and its allies have said they were not contemplating military intervention even if they have sought to foster tribal opposition to Qatari emir Sheikh Tamim bin Hamad Al Thani led by lesser known members of the ruling family. Six months later, the UAE and Saudi Arabia have yet to act on their threat, creating business opportunities as Qatar settles in for the long haul and structurally ensures that it will no longer depend primarily on its Gulf neighbours. Food is one key area, making food security a Qatari priority. Turkey and Iran were quick to step in to fill the gap created by the Saudi ban on export to Qatar of dairy and other products. With the import of some 4,000 cows, Qatar has sought to achieve a degree of self-sufficiency with domestic production within a matter of months accounting for approximately 30 percent of consumption. Nonetheless, with a minimal food processing industry, Qatar will seek to diversify its sources, creating opportunity for Asian producers. With the loss of some 20 Gulf destinations as a result of the boycott, state-owned Qatar Airways, the region’s second largest airline, may be the Qatari entity most affected by the crisis. Against the backdrop of a likely annual loss, Qatar Airways is looking to expand its route network elsewhere and weighing stakes in other airlines. Asia is an obvious target. Qatar is scheduled to initiate flights to Canberra in Australia, Chiang Mai and Utapao in Thailand, and Chittagong in Bangladesh in the next year. The airline has rejected proposals that it bid for Air India, but plans to move ahead with plans for the launch of a domestic Indian airline. Elsewhere, Qatar Airways acquired a 9.61 percent stake in troubled Hong Kong-based Cathay Pacific for $662 million. Similarly, Qatar has had to compensate for its loss of port facilities, primarily in the UAE by diverting to Salalah in Oman and Singapore. While that solved the Gulf state’s immediate bottlenecks, it is probable that Qatar will take an interest in other Asian ports in competition with Saudi Arabia and the UAE. 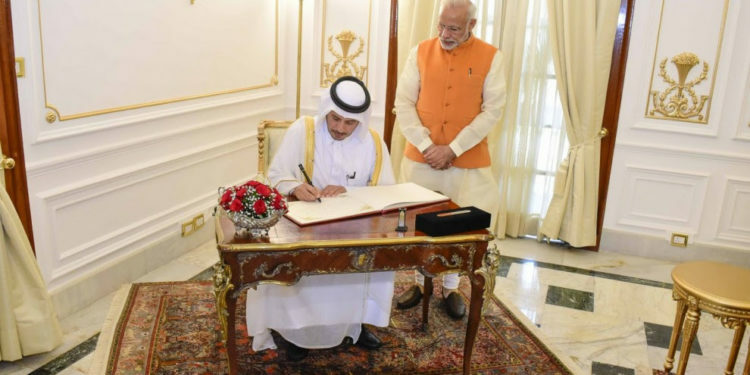 Given Saudi interest in China-backed ventures such as Pakistan’s Gwadar and the Maldives, Qatar could well look at Indian alternatives, including the Indian-supported Iranian port of Chabahar, a mere 75 kilometres further up the coat from Gwadar. Singapore port has stepped in with Qatar availing itself of shipping and logistical services. Vietnam and India see opportunities in the sale of food and construction materials. Perhaps most fundamentally, Asian countries like India, in a bid to ensure the security of their energy supplies, are looking at diversifying their sources and increasing the non-Middle Eastern portion from producers like the United States. Indian Oil minister Dharmendra Pradhan adopted a tough stand in recent talks with OPEC Secretary General Sanusi Mohammad Barkindo, advising him that India was looking at alternative sourcing. India recently cut crude oil imports from Iran because of stalled negotiations over the development of an offshore gas deposit in the Gulf, forcing Iran to look for alternative buyers in Europe. The Gulf, irrespective of if and how the crisis may be resolved, is unlikely to return to the status quo ante. As a result, the crisis is certain to influence political, economic and commercial relationships for decades to come. That creates opportunity that Asian nations potentially can capitalize on. Buhari Is A Shammer Jammer!